Pensacola, Florida (CNN) -- As the "H2O Below" charter boat leaves the dock and heads into Pensacola Bay, it is chock full of divers. But there's not a single paying client aboard. The boat is carrying a team of local dive industry professionals -- along with an underwater cameraman -- who arranged Wednesday's trip to show that the Gulf oil spill has not affected the prized dive site, the USS Oriskany. "We're going to go out look at the ship, assess the marine life on it and find that there's no oil anywhere around," said Jim Phillips, who owns a dive shop in the area. Aside from its beautiful white sand beaches, Pensacola is home to the only aircraft carrier that has been turned into an artificial reef. 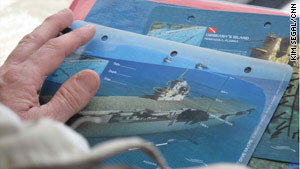 Divers travel from all over the world to see the USS Oriskany not just because it's the world's largest manmade reef. The "Great Carrier Reef" as it is sometimes called is also an important piece of history. "It has a long history in the Korean War [and] it was also the last piece of American soil that [U.S. Senator] John McCain saw before he was shot down," said Douglas Hammock, the owner and captain of H2O. McCain's aircraft flew off of the Oriskany in 1967 before it was shot down during a bombing mission over Hanoi, Vietnam. McCain was held as a prisoner of war until 1973. A year before McCain's mission, the USS Oriskany suffered an onboard fire that killed 44 sailors -- one of the worst fires to engulf a ship since World War II. In 2006, the ship was purposely sunk in an upright position to create the reef, which has attracted nearly 40 different species of fish. The $20 million project was intended not only to serve as a habitat for marine life, but also to boost tourism in the Pensacola region. 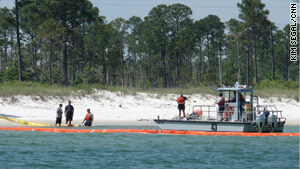 A containment boom is laid at Pensacola beach to protect the shore from the approaching oil. Now, the historical dive site is threatened by the leaking oil rig more than 100 miles away that continues to spew an estimated 210,000 gallons (5,000 barrels) of crude into the Gulf every day. Phillips said he's been assuring his customers that, as of now, there is no need to cancel their scheduled dive trips to the USS Oriskany, which is about an hour-long boat ride from the shore. "The marine life in our area I'll put it up against anywhere in the world as far as the quantity and quality and variety," says Phillips. 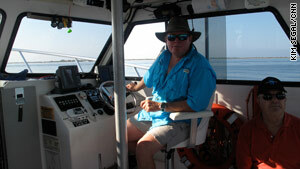 Boat captain Douglas Hammock, a lifelong Pensacola resident, fears the oil slick could impact the economy. As of Wednesday afternoon, the oil spill was stretched from the northeast side of the Mississippi Delta to about 60 miles off Pensacola, Florida, according to Charlie Henry of the National Oceanographic and Atmospheric Administration. Phillips said some of his clients have cancelled their dive trips, but most people are just calling and asking about the water conditions. So the Pensacola team plans to post video of Wednesday's dive on the Internet to show people that the oil spill has not impacted this Gulf Coast community. Not yet anyway. No oil was expected to impact the shores of Pensacola beach and beyond through the weekend, Escambia County's disaster response team said Thursday. Wednesday was a perfect day for filming an underwater dive. The Gulf of Mexico looked like a lake, the sun was bright and marine life could be seen as the boat made its way to the dive site. Sea turtles were sunning themselves on the water's surface. A few dolphins jumped in and out of the water. In the air, the U.S. Navy's Blue Angels team flew across the clear blue sky. As the boat anchored at the USS Oriskany site, Hammock calmly waited for the news from the divers. He had calculated that the oil was still about 90 miles away. About a half hour after entering the water, the divers emerged. "How was it?" Hammock asked. They all had similar answers. The divers say the marine life looked amazing. There were all types of tropical fish on the wreck, as well as the resident octopus, a lot of barracudas, and a sea turtle. Even better news: there were no signs of oil. Hammock is encouraged by the news, but repeated the words of so many business owners on the Gulf Coast. "This oil will be devastating to us," he said. "If this oil shows up here it will definitely shut down a big industry in the panhandle."